To understand the impact of an unwinding Yen carry trade and its impact on the global economy, it is important to understand why the Yen carry trade occurs in the first place. Japan has very high levels of savings – a pool of $15,000bn. This pool of savings is worth more than the total GDP of the US economy. Japan’s excessive saving contrasts with the excessive spending and borrowing of the US. 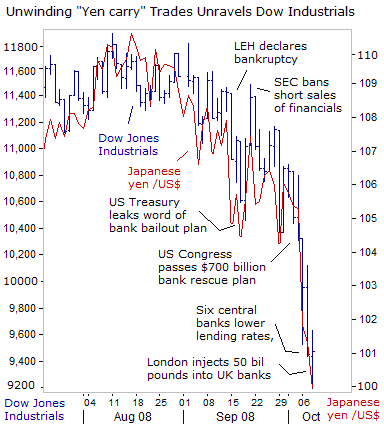 Also many Foreign investors, especially American have borrowed in Yen to invest in global stock markets. This is known as the Yen Carry Trade. The Yen Carry trade is profitable if currencies are stable and / or the dollar is rising against the Yen. If you borrow in Yen and then the dollar falls, you could lose despite the interest rate difference. Recently the global economy has been entering a recession. This means interest rates are falling and are predicted to fall in Europe, America and other countries affected by slowdown. This means that the difference in interest rates between Japan and the rest of the world is narrowing. There is no longer the same incentive to borrow Yen and invest oversees. Because US and European interest rates are low, Japanese Investors have started to sell their dollar and Euro investments and return their money to Japan. This means the Yen has been appreciating. Because the Yen is rising, the Yen carry trade becomes unprofitable, investors could lose substantial money if the Yen rises against the dollar and Euro. Therefore, with the Yen rising, people are selling their foreign investments and ending their carry trade. This increases demand for Yen even more, causing a further rise in the Yen. 1. The Japanese have an incentive to sell their foreign investments. This means selling shares. Therefore, stock markets around the world could fall as the Japanese unwind their $6,000bn foreign holdings. (Japan is by far the world’s largest creditor nation. 2. As the Yen rises, people will rush for the exits selling their foreign currency to repay their Yen loans. The rise in the Yen causes a speculative bubble causing a large rise in the Yen and fall in other countries. 3. Harms Japanese exports. A higher value of the Yen makes Japanese exports more expensive reducing demand and causing lower economic growth and possibly deflation. 4. To deal with the rising Yen and slowing economy, Japan reluctantly cut its base rate from 0.5% to 0.3%. However, there is only very limited scope for future interest rate cuts. 5. Depreciation in other major currencies.